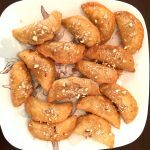 Gujiya, or Milk Fudge Turnovers, are a popular Indian dessert commonly made in the northern part of India around the festivals of Holi and Diwali. 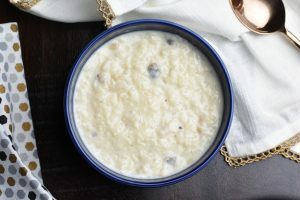 Gujiya is a sweet dumpling that is made by stuffing pastry dough with sweetened milk fudge (known as khoya or mawa), chopped nuts and coconut flakes. Traditionally, you fry the dumplings to make the deep fried gujiya and finish off by glazing with a thick sugar syrup. The process of making Gujiya requires making a dough with all-purpose flour, ghee (clarified butter) and water. 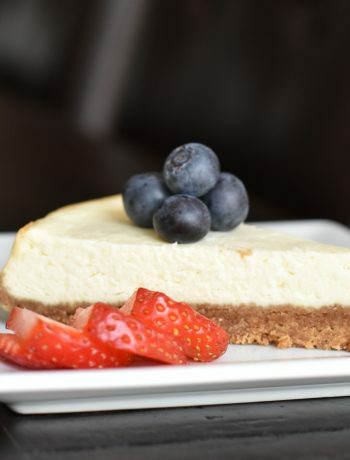 You combine all ingredients and make a soft dough, set it to rest while you prepare the filling. The filling of gujiya is made with Khoya as a base. 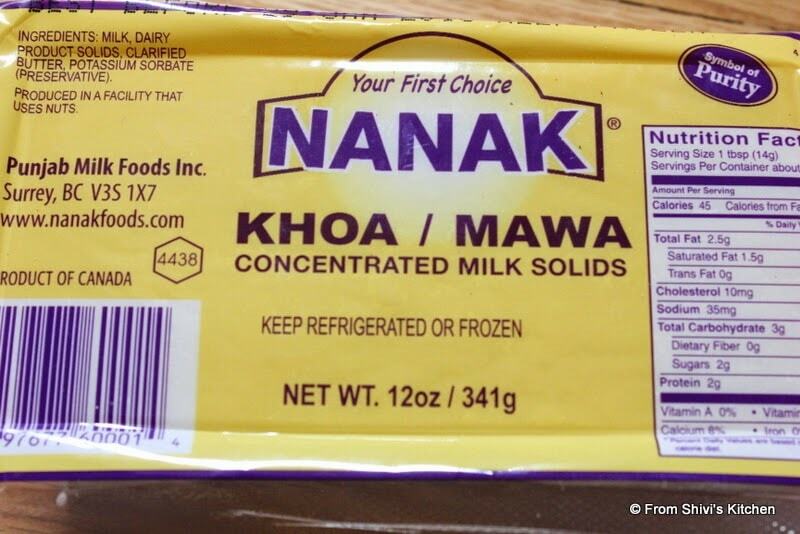 Khoya, also known as Mawa, is dried milk solids. It is available in the freezer aisle of your local Indian food store, right next to the Paneer (Indian Cottage Cheese). 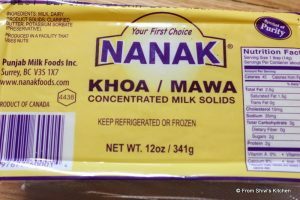 I personally like the brand Nanak for khoya. It comes in a 12 oz pack. This quantity of Khoya makes stuffing good for making 40 Gujiya. 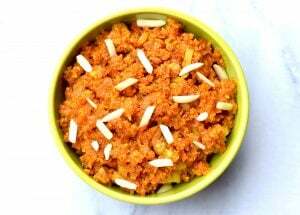 You can either divide the Khoya in half and freeze it, or, make the entire stuffing and freeze that for a later use. 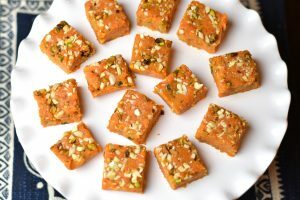 I always prefer to make the stuffing and freeze half for later use, for making Gujiya, or add it to my Gajar Halwa (Carrot Halwa) instead of Khoya! This is my mother-in-law’s ‘family-famous’ Gujiya recipe. The Gujiya mix is made by crumbling khoya in a mildly warm skillet. I do this step in the microwave now; it saves so much time and effort. You then add chopped nuts like cashew nuts, almonds and pistachios. Finally add desiccated coconut and freshly ground cardamom powder. 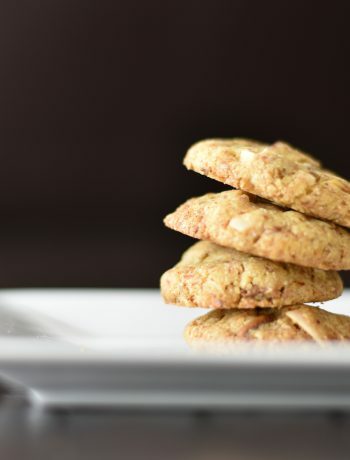 You can also add dry fruits like finely chopped raisins or dates. When this mixture is cool, add the sugar to the mix. Now your Gujiya is ready to assemble. A small dough ball is rolled into a circular shaped disc, about 3-inch in diameter. About 1/2-3/4 tablespoon of khoya mixture goes in the center and then the dough is folded in a crescent shape and edges are sealed. 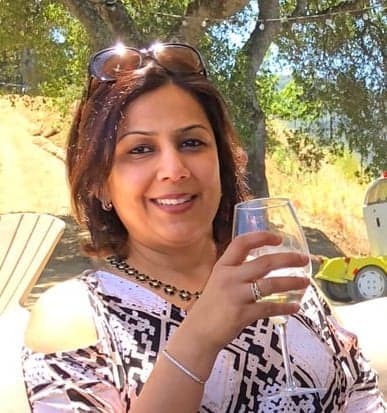 That’s your Gujiya. You then deep fry the gujiya in medium warm oil till it turns golden in color. Remove the gujiya and put it straight into a sugar syrup. 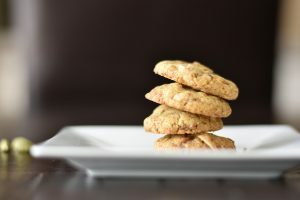 Toss a few times, remove from the syrup, and set aside on a platter to crisp up. 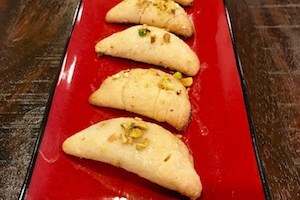 Garnish the gujiyas with chopped pistachios. 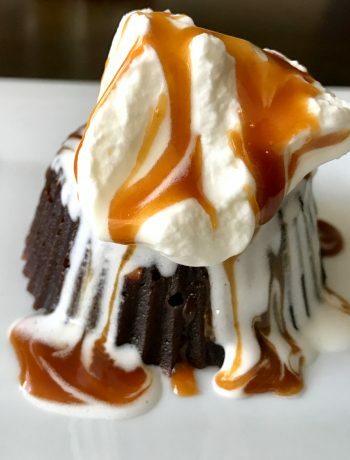 It is simply a bite of heaven! My family loves the traditional gujiya. But during the festival season, my husband and I end up “over-indulging”, if that’s a word. I’m sure many can relate to that. So, after many experiments to reduce the cooking time and to make the gujiya a bit healthier, I finally hit upon this recipe for Baked Gujiya. Check out this Baked Gujiya recipe, which is my 30-minute, quick and healthier, baked version of this favorite. Deep Fried Gujiya, or Milk Fudge Turnovers, are a popular dessert made in the northern part of India around the festivals of Holi and Diwali. 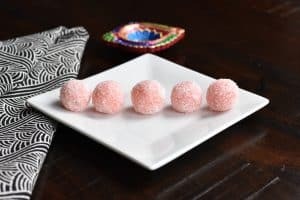 It is a deep-fried sweet dumpling that is made by stuffing pastry dough with sweetened milk fudge (khoya), chopped nuts and coconut flakes and is glazed with a thick sugar syrup. Make Dough: In a large mixing bowl, add soozi and melted ghee (or oil), to the sifted flour and mix with a fork to to mix everything well. I make this dough using the dough attachment on my Food Processor. Add water a few tablespoons at a time to reach a semi-soft dough which has a pizza dough like consistency. Remove dough and knead it for 1-2 minutes. Cover with a damp cloth for 15 minutes. Knead again before rolling it out. 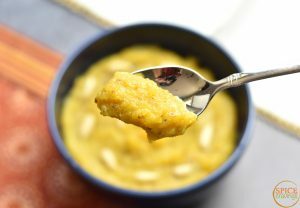 Make Stuffing: Microwave Khoya for 2-3 minutes, in 30 seconds increments to make khoya easy to crumble. Heat non stick skillet/pan on medium heat. 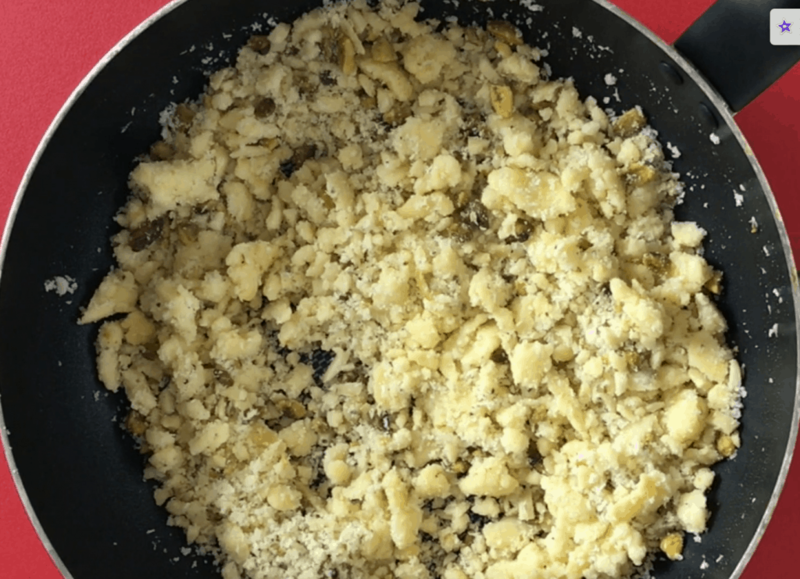 Crumble khoya in to the pan. Using a wooden spoon or spatula, press down and break it in smaller pieces. Keep pressing till khoya becomes soft, consistency of a soft dough. (it should be pliable). Turn off the heat. 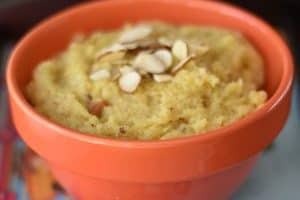 Alternatively, you can do this whole process in the microwave by heating khoya for 3-5 minutes in 1-minute increments, stirring in between, till the khoya becomes soft. Add chopped nuts, coconut powder and cardamom powder. Mix well and allow to cool off for a few minutes (4-5). Add sugar and mix well. Taste to adjust sugar to your taste preference. The stuffing is ready. Assemble Gujiya: Knead dough for 1-2 minutes and divide it into 20 balls. Dust your rolling pin with some all purpose flour and roll out each ball into a thin circle of about 3 inches diameter. Apply sealing paste on the edges of half the circle. Place about 2 teaspoons or 1/2 a tablespoon of filling in the circle and then fold over to make a crescent shape, and seal the Gujiya edges, (just like you would for a turnover). Fry Gujiya: Heat oil in between med and med-high. Drop the Gujiya and fry till golden brown- keep flipping 3-4 times. It takes about 4-5 minutes for them to turn golden brown, this time may vary depending on your heat level. Fry the gujiya in two batches (not more than 10 in each round). Make Sugar Syrup: While Gujiya is frying, heat a sauce pan on medium heat. Add sugar and water. Bring to a boil and simmer on medium heat till it thickens enough to coat the back of a spoon, about 5-6 minutes. Glaze and garnish: Dip fried Gujiya in the cooled sugar syrup, coating well on all sides. Sprinkle some crushed pistachios on top. Place on a wire-rack for setting.